M. Moorthamer. At the "Lemmens Institute"(highschool) he enjoyed a more broad musical education with extensive solfege, theoritical and harmony lessons. At the same time he obtained first prizes chamber music and solo violin at the Belgian National Youth Competion 'Belfius Classics'. After graduation in the class of Nico Baltussen, he began his bachelor studies with A. Czifra and J.-J.Kantorow at the Rotterdam Conservatory. In this same period he enjoyed intensive coaching with teachers such as Hans Mannes, Rainer Honeck,and Regis Pasquier. His Master studies led Philip first to join the class of Charles-Andre Linale in Aachen. A dramatic car accident unfortunately stopped this collaboration in 2003, after which Philip met Gordan Nikolic at the Rotterdam Conservatory. Under his guidance Philip obtained his Master degree in 2004. 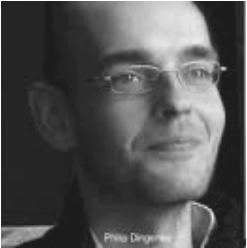 Philip Dingenen is member of the Netherlands Chamber Orchestra as a 1st violin player since 2009. His orchestra activities offered him the opportunity to work with conductors such as Sir Colin Davis, Valery Gergiev, Y. Nezet-Seguin, Y. Kreizberg and many others. Chamber music recitals brought him in recent years to play at "La Monnaie"(Brussels), the Royal Concertgebouw Amsterdam, the Ticino Festival and the Grachtenfestival Amsterdam.